A few Christmases ago I received Vegan Cookies Invade Your Cookie Jar and it sat on my shelf for months before I finally opened it up. Once I did, I baked as many of the recipes as I could and sent them off to work with my husband. The consensus thus far is that the caramel pecan bars are the best, but these are a close second. Here’s where to buy it!! I decided to try using aquafaba instead of flax egg in these and I wasn’t quite sure it would work. 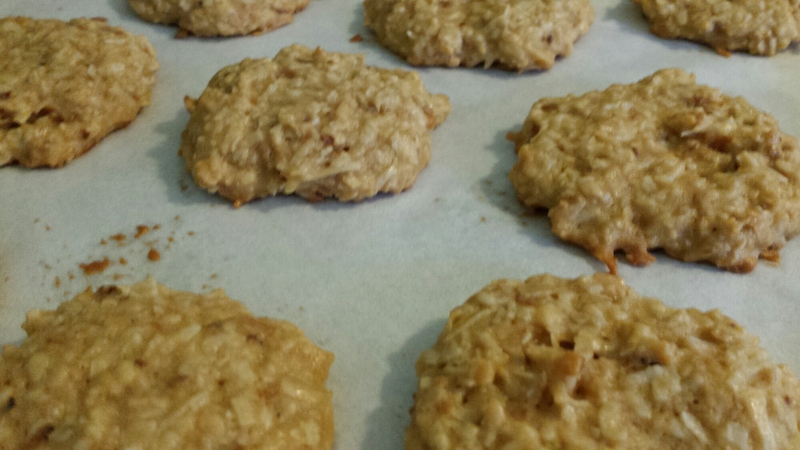 To my surprise, it worked perfectly and resulted in a fluffy and chewy cookie, as opposed to the dense flax – egg cookie. 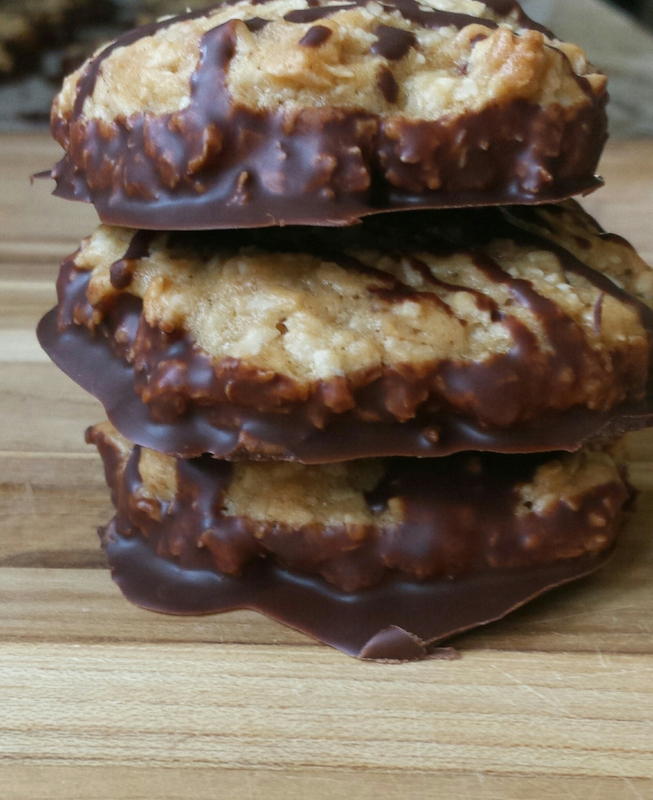 If you loved the covered shortbread girl scout cookies by the same name, you will love these, plus they’re way easier to make! 1. Toss coconut into a skillet over medium heat and toast until brown. Keep a close eye on it as it burns easily. 2. Cream together coconut spread, aquafaba, brown sugar, and vanilla and coconut extracts until smooth. Add flour, salt, and baking soda and mix until a soft batter forms. Fold in toasted coconut. 3. Drop tablespoon sized blobs of batter onto a large parchment lined baking sheet (you may need two.) Flatten with a spoon. 4. Bake at 350 ˚ F for 8 minutes until edges are golden brown, then remove from oven and let stand until cool. 5. Melt chocolate chips and coconut oil in a microwave safe bowl. 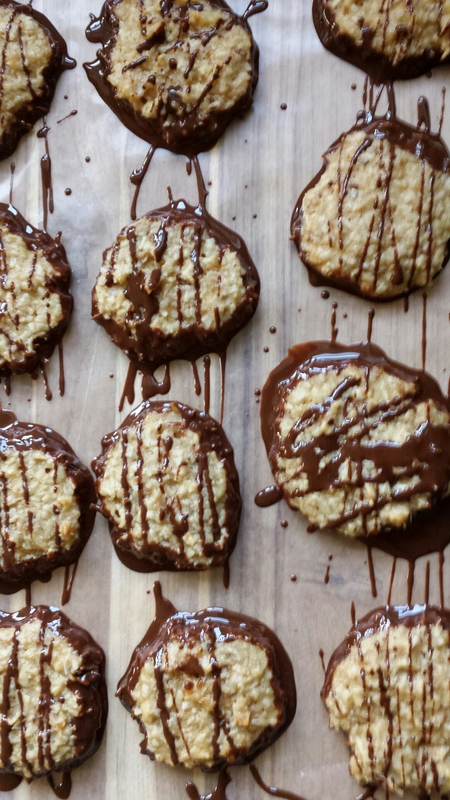 Dip bottoms of cookies in the chocolate and place on wax paper. 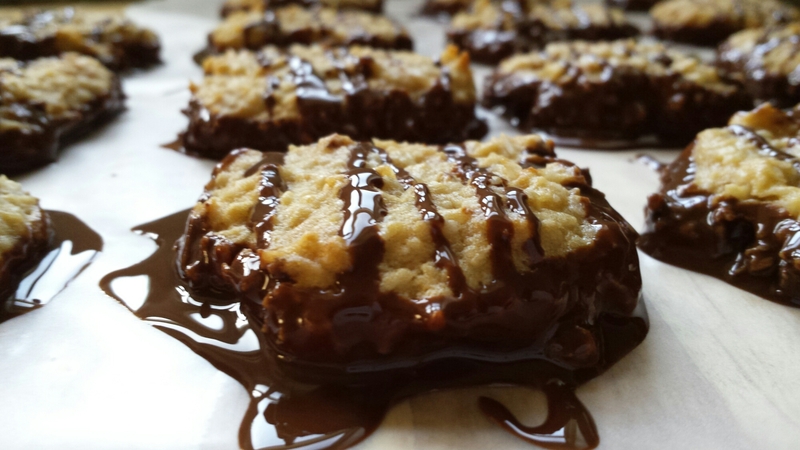 Drizzle extra chocolate over tops with a spoon. 6. Refridgerate for at least 30 minutes or until chocolate hardens.